In this country it is fair to say that we get limited time to spend in our gardens. With the cold months and the seemingly endless downpours we have to suffer, quality time in the garden does tend to come down to a couple of months a year. This endurance of the cold and rain makes us all the more hungry for time in our garden when the sun does shine, and by god us Brits like to make the most of it don’t we! As soon as the sun comes out and the temperature rises above 10 degrees, you can smell BBQs cooking and kids playing in their gardens, and all seems right with the world once again. But without our precious garden furniture we couldn’t do any of this. Garden furniture brings comfort and style to our gardens, allowing us to sit in peace and harmony and socialise with friends. So where did our love affair with garden furniture start? Well, as much as we love our garden furniture, I’m afraid it did not start in Britain. The dawn of garden furniture began in much warmer climates, where people spent much of the year outdoors. In fact, we have to go all the way back to the Romans for the first evidence of garden furniture as we know it. During excavations of Pompeii stone benches and seats were found dating back to 43AD. These examples of furniture were found in the ancient gardens of Pompeii, which were an important part of people’s lives throughout the Romain empire, as it is today throughout Italy and the Mediterranean. Although these are the oldest known specimens of garden furniture, it is believed the Egyptians and the Ancient Greeks predate these. Egyptians archaeologists have found furniture made from reeds and grasses and whilst these would have been used for indoor furniture, they were no doubt also used outside. Examples of Egyptian furniture includes chairs, tables, chests and baskets. The Ancient Greeks made a lot of furniture out of wood as it was easy to style and fashion, but outdoor furniture including benches and stools were made from stone or metal. This trend is believed to have been copied by the Romans. During the medieval times Britain was first introduced to garden furniture as we know it. Gardens and courtyards started to spring up in monasteries, churches and castles, making use of the outdoor space to provide food and medicine. As gardens developed and became more popular, seats made of turf became a common sight, providing people with a base to sit and enjoy the outdoor space. Turf benches came in all shapes and sizes, sometimes running the entire perimeter of the garden. They were usually constructed with a frame of wood, brick, stone, or wattle, which was then filled with soil and turf laid on top. While turf benches may seem quite rudimentary, they are still very popular today and are a great way of “being at one with nature” and comfortable at the same time. 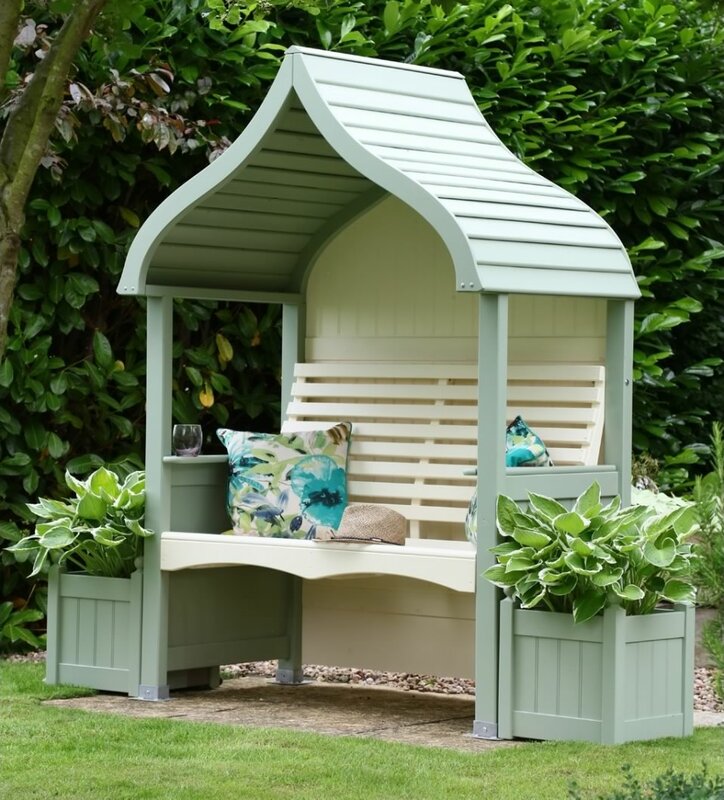 As with many of the advancements that we have come to know and love, it was the Victorians that really pulled garden furniture by the scruff of its neck into the modern era. The 1800s saw an explosion in development of public parks and gardens, and seaside resorts and piers, which inevitably lead to lots of people all needing seats. This coincided with the development of cast-iron large-scale production and the rest, as they say, is history! The first park bench was born, and this became the de facto item in every park and garden across the country. The garden bench industry was born and kept on growing as new and unique styles were introduced. After the 2nd world war gardens and outdoor spaces became popular again with people meeting, eating and congregating outside. Plastic garden furniture, although quite unsightly, became the default items in almost every British garden due to its low cost and low maintenance. In the following decades leading up to the 21st century, we have seen many developments in garden furniture with cast iron, aluminium, steel and weave all taking pride of place in the world of garden furniture manufacturing. 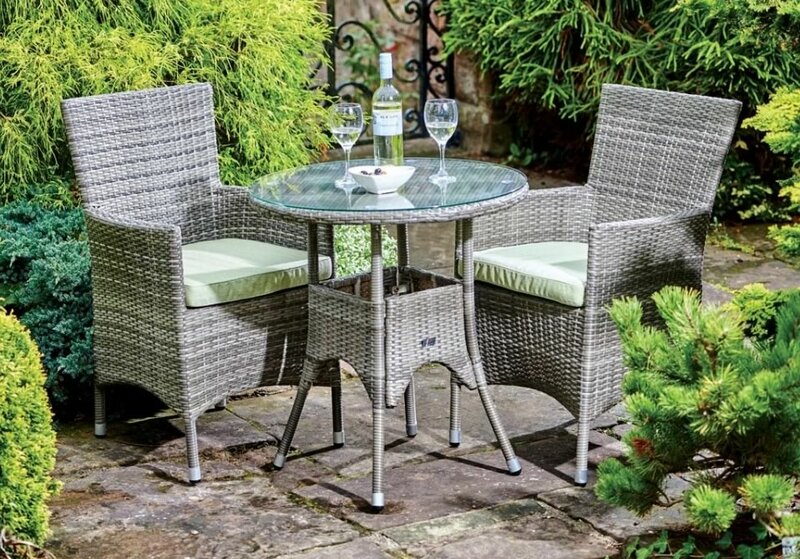 Today there are so many different styles and designs of garden furniture to choose from, there really is something available to suit every taste. As we spend more of our time outside, creating a comfortable and stylish outdoor space has become paramount, so we can socialise, relax and spend quality time with our friends and family. Who knows what developments in garden furniture the next 50 years will bring us, but we for one cannot wait to find out! We are very lucky living in the 21st Century. There are so many different garden furniture options available, we really spoilt for choice. To make your job easier, we have included below a short description of the different types of garden furniture available and how they benefit you. Chairs are a requisite for any garden. Sure, you could sit on the grass, but Britain is not known for its dry weather and nobody likes a wet patch on the trousers! If you want to sit out in your garden and enjoy the outdoors, a chair or two is your first port of call. The humble garden chair now comes with so many different styles and options, there is something suit all gardens and all tastes. There’s nothing quite like eating and drinking outside, enjoying the balmy summer evenings with your friends and family. But, unless you fancy sitting on the floor or eating standing up, you’re going to need an outdoor dining set. There are loads of different types of dining sets available to suit all shapes and sizes of garden, and all tastes. If you’re a traditionalist, you may opt for a round dining table, perhaps in wrought-iron or cast aluminium for an authentic, traditional Victorian feel. At one with nature? Maybe a wooden dining set would be for you, made from natural materials, enhancing the organic garden style. If you have more modern tastes you may be inclined to go with the modular dining sets now available, which offer comfort, style and practicality for your outdoor space. No matter what style garden you have and individual tastes, there is a dining set out there just waiting to become a centre-piece for your outdoor space. Bistro sets are perfect for smaller gardens, patios or balconies, and offer much the same as a dining set albeit slightly more petit. There’s definitely something stylish and romantic about a bistro set, conjuring up images of warm summer evenings, relaxing on a balcony, or enjoying a glass of wine at a bistro in a warm country. There are some really stylish sets available too. Whether you are looking for a traditional, European style made from steel or cast-iron, a more natural wooden set, or a modern rattan set made for comfort and style, there are styles to suit all tastes. Benches, as we know them, first became common-place in Britain during the Victorian times. In the 1800s public parks and seaside resorts were developed throughout the UK, which lead to the mass installation of public benches – well, we all need somewhere to sit right? There is, without a doubt, a cultural nostalgia associated with garden benches. Memories of visiting parks as a child, or Victorian benches in movies like Mary Poppins or Peter Pan, all help to convey that feeling of nostalgia. Culturally benches have marked their place in British minds and hearts, and over the years they have remained an important part of our heritage. It is now very common to see benches in gardens up and down the country. So, which is the right bench for your garden? It really depends on the style of your garden, and also your individual taste. There are many different styles of bench available ranging from traditional wooden benches, aluminium benches and even weave benches. Looking for something a little bit different, how about a planter bench? Providing you with comfort and somewhere to sit, and also an area to get your green fingers busy too! 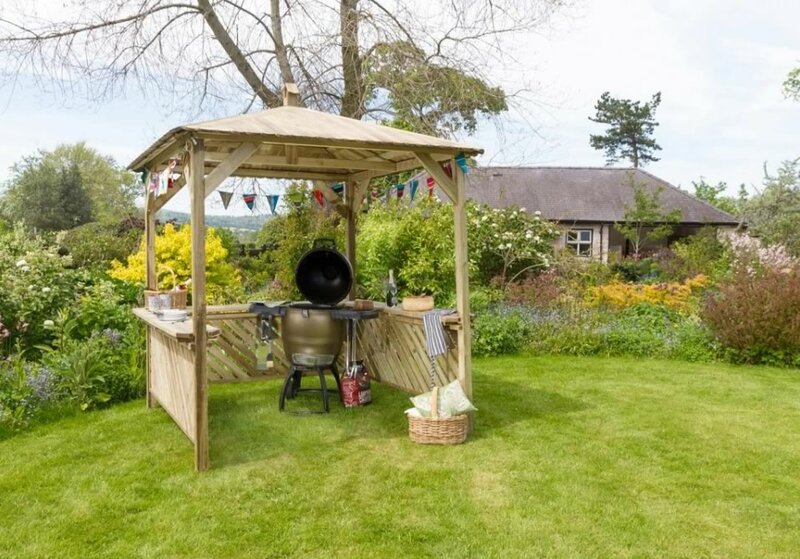 Gazebos and pergolas come in all different styles – Contemporary wooden gazebos, Victorian pavilions, popup gazebos for days out with the family – There really is a style to suit everyone. Another great reason to get a gazebo or a pergola, is that they are really easy to maintain. Made for the outdoors, they come ready-treated and are made to last in all weather conditions. 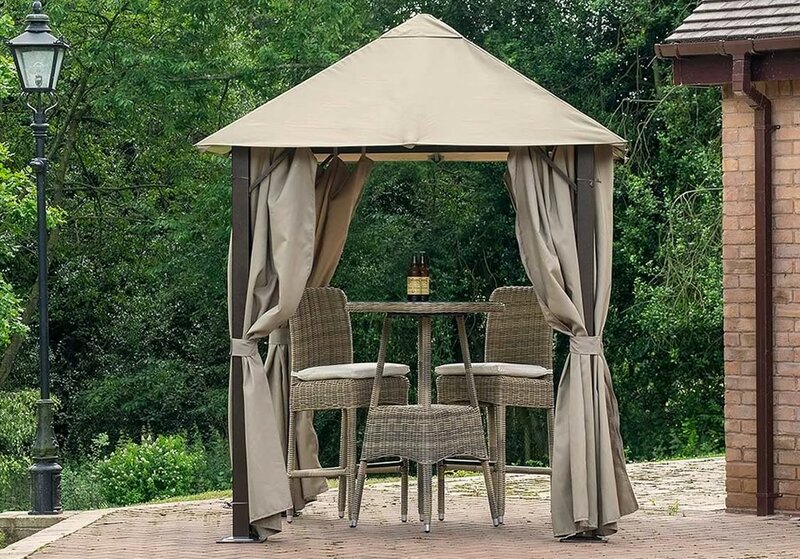 So, start looking for your perfect gazebo or pergola and start organising dinner parties and social gatherings with your friends and family… Or, start planning that much needed relaxing ‘me time’ that you’ve been waiting for. You won’t regret it! Garden furniture can be made from a variety of materials, and each material comes with certain advantages and disadvantages. What they all have in common is that they are durable, weather resistant and easy to maintain, although this does vary to some degree with each material. We have included below the different types of material used to make garden furniture and their benefits and drawbacks. Wrought-iron was very popular during the Victorian era due to the increase in productivity within the iron industry. It was used to make tables, chairs and benches and conveys the classical Victorian-style that we have all come to love. It is strong and durable but can be very heavy and difficult to move. It is also prone to rust so requires painting when cracks appear. Cast Aluminium provides a similar look to wrought-iron and is a good alternative, offering a similar style at a cheaper price. It is much more common these days to have garden furniture made from cast aluminium than wrought-iron and is the most popular material used for metal garden furniture. There are some good benefits too. It is much lighter than wrought-iron, so can be placed on your lawn without causing damage, it is rust resistant and requires very little maintenance. Stainless steel has become increasingly popular in garden furniture production but is less common than wrought-iron or cast aluminium. Its popularity tends towards contemporary garden furniture, due to its bright and shiny appearance. It is also extremely durable being completely rust and mould resistant. Wood is one of the most traditional materials used for garden furniture, with its use as a source of building material and furniture dating back to 3000bc. And its obvious why wood is so popular. It’s strong, stylish, easy to manipulate and naturally beautiful. Wooden furniture looks natural outside with its organic style and patterns and will add style to any garden or outside space. A word of warning though, wood does require quite a bit of maintenance to keep it looking good as new. The British weather can age wooden furniture fairly quickly, so to keep it in shape it needs a sand and a varnish once a year. On the plus side, with the flexibility to sand, paint and varnish, you can quickly turn old, tired looking furniture into something stylish, unique and new. 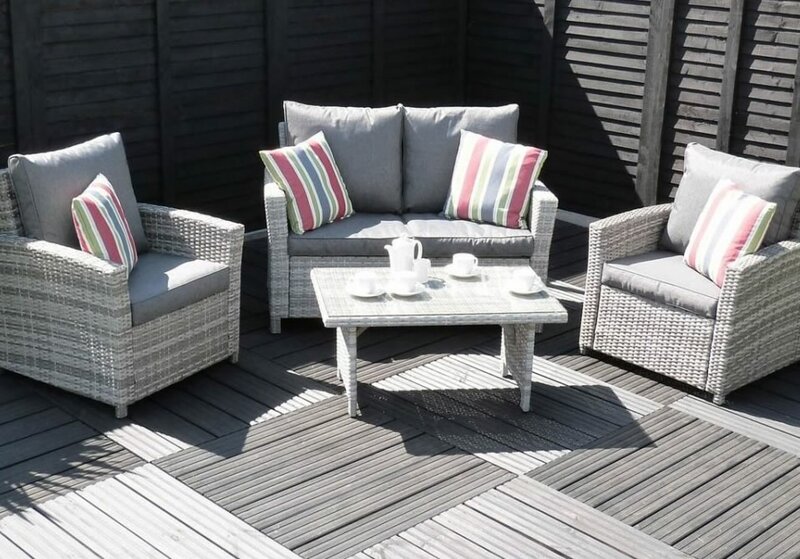 Weave or rattan garden furniture has hit the scene fairly recently and is now one of the most popular materials available. But did you know, it’s actually been around for very long time and is one of the oldest forms of furniture making? The Ancient Egyptians are the earliest civilisation known to have created weave furniture, with examples even found buried in Pharoah’s tombs. The Romans then took the baton and integrated woven furniture into their culture. In the 17th and 18th centuries wicker furniture was being used in Northern Europe and Asia, but it wasn’t until the Victorian era that it made its way to the shores of Britain. Whichever material you choose, make sure it fits your style and personality. Each different type of material has its pros and cons and will be perfect for different situations. Get hunting, and good luck! There really is some fantastic garden furniture on the market today, and that is all thanks to some equally fantastic companies who consistently push the boundaries and get us furniture lovers all excited. So, who are the leading garden furniture brands? AFK Garden is a company based in Lincolnshire specialises in design and manufacturing high quality wooden garden furniture. Their range includes arbours, swing seats, planters, bridges and log stores. Anchor Fast have been around for over 25 years and design and manufacture a range of wooden garden furniture for consumers and the education and leisure markets. This includes schools and universities, pubs and parks. For 75 years Garden Furniture Global have been designing and manufacturing luxury garden furniture. They specialise in both aluminium and resin weave furniture including from seats, tables and sofa sets, and they also produce parasols, gazebos and accessories. Glencrest was formed in 1981 as a cushion manufacturer. They now design and manufacture a range of garden furniture including bistro and dining sets, sofa sets, parasols and cushions. They are well-known for their luxury dining sets including the Sandringham, Seville, Balmoral and Buckingham sets. Innovators International is a world-renowned brand which was incorporated in 1988. 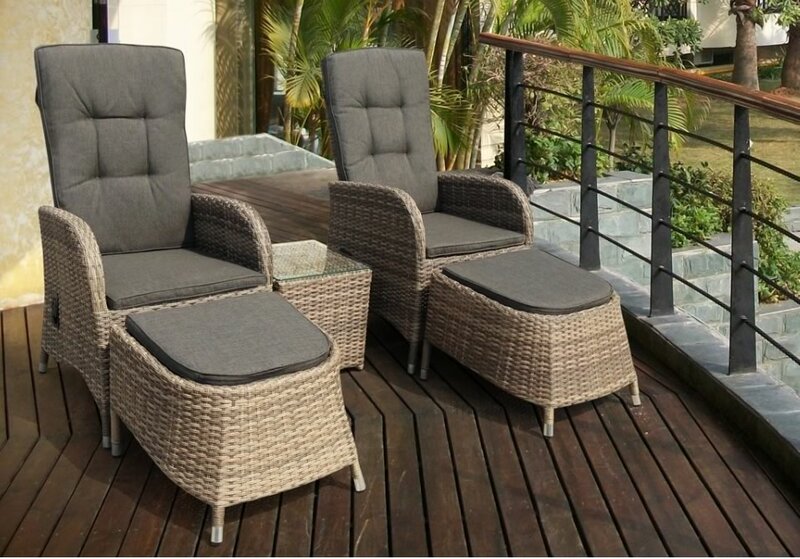 Since then they have been designing and manufacturing high quality garden furniture of all different types including rattan, teak, oak, iron and resin. Their product range includes dining sets, loungers, benches, sofa sets, bistro sets, gazebos, parasols and much more. Kaemingk offers a range of beautiful, original and creative items for your home – both inside and out. Their outdoor living collection ranges from sofas and garden benches to cushions, fountains and lighting. If you’re looking for something stylish that’s a little bit different, Kaemingk’s range of products is well worth a look. Masters Outdoor Leisure is a company based in the Cradley Heath in the West Midlands, who specialise in the design and manufacture of stylish gazebos to suit all occasions. 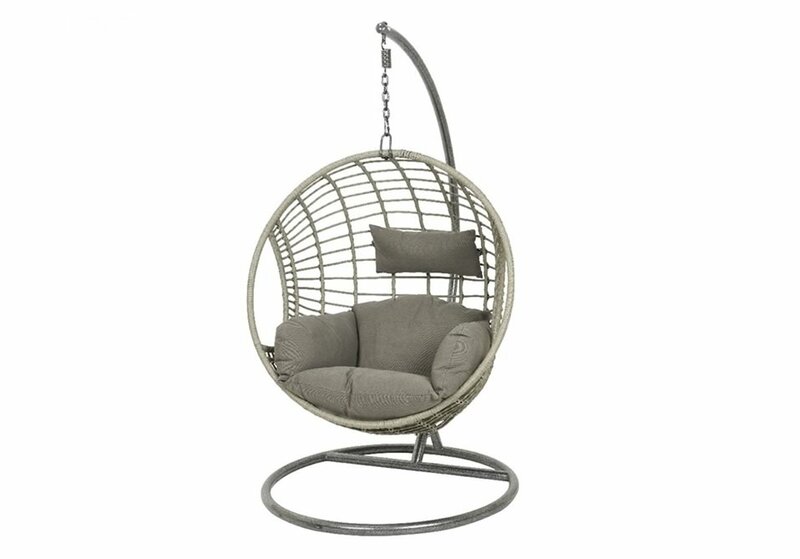 They also provide gazebo accessories including casual chairs, swing hammocks and cushions. Mercer Agencies is based in Northern Ireland and has been selling a range of products for over 26 years, including garden furniture, Christmas accessories, LED pull lights and click clack tiles. 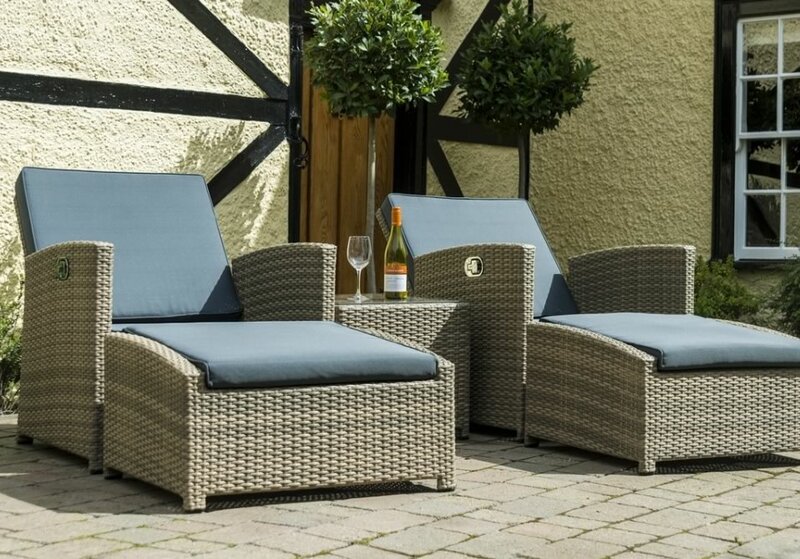 Their garden furniture includes the popular and stylish Amalfi range. 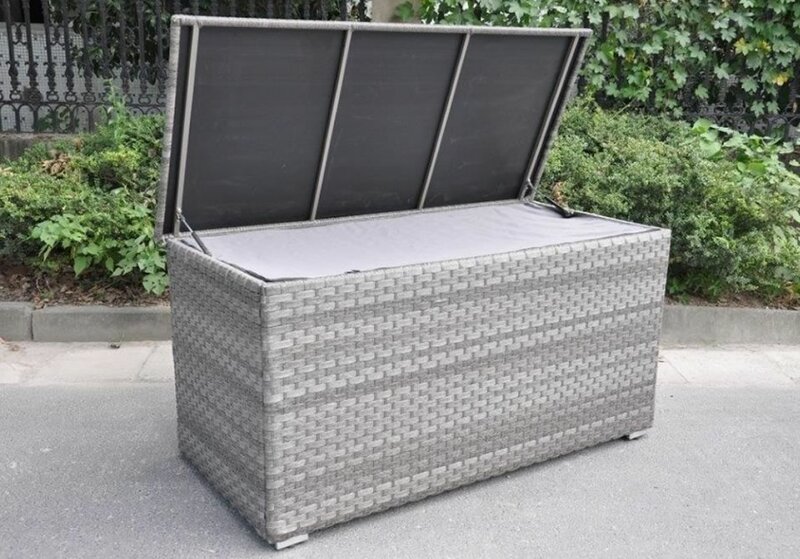 Supremo Leisure is a popular and stylish brand who provide a range of weave, aluminium and fabric garden furniture items for formal dining, or relaxing with the family. Their range includes dining sets, sofa sets, duo sets, parasols and more. Zest 4 Leisure was founded in 2005 with the aim if bringing high quality timber products to retailers and garden centres. Their products look fantastic and can really add style to any outdoor space. They provide a range of timber products including tables, chairs, benches, companion seats, arbours, pergolas, fences, storage boxes and climbing support for plants. If you like wood, pay these guys a visit! Keeping your garden furniture looking great is no easy task, but it is essential if you want it to get years of enjoyment out of it. Nobody wants to invest in stylish and comfortable garden furniture, only to have to pay out to replace it after a couple of years. So, here’s some tips on keeping your furniture looking great and working as it should. Cast-iron is a beautiful material which can provide you with a traditional, authentic Victorian-style to your outdoor space. The compromise you face when purchasing this type of furniture is that it requires quite a bit of maintenance to keep it looking great. The biggest problem with cast-iron is that it is prone to rust, which means regular cleaning and touching up with specialised metal paint when required. The need to do this can be minimised by keeping the furniture covered with waterproof coverings during the wetter and colder months. It also needs cleaning every 6 – 12 months to remove dirt, dust, mould and algae which will prolong the life of the paint. Unlike cast-iron, aluminium garden furniture is rust-proof making it easier to maintain. All it requires is a wipe-down with soap and water once a year to clean off the dirt. It is much lighter than cast-iron, which means it is much easier to move into your shed or outhouse during the winter months. When it is outside, we recommend covering with a waterproof cover to prolong its life. As with all painted furniture, it is possible for the paint to get chipped or cracked. If this happens, clean the area and touch it up with some metal paint. Stainless steel garden furniture is becoming increasingly popular, and with good reason – it requires very little maintenance to keep it looking great. Stainless steel is also rust and mould-resistant and will not be damaged from direct sunlight. To keep it looking great all year round, all you need to do is give it a wipe with water and soap every few weeks, and polish it with a dry cloth to keep it nice and shiny. Again, it’s always best to keep it covered when it’s not being used, so invest in a decent waterproof cover, or put it away in your shed or outhouse. 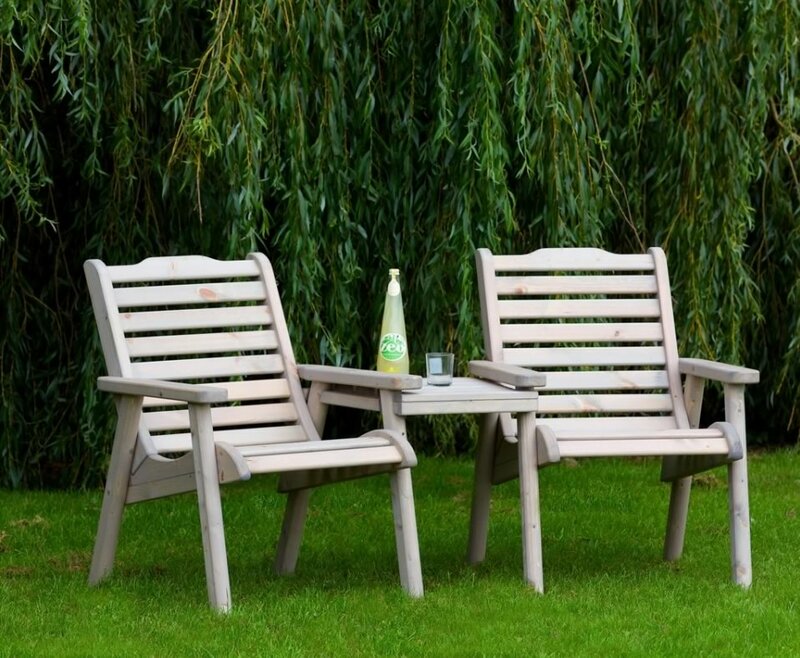 It’s very difficult to beat wooden garden furniture in terms of style. It has an authentic, natural and organic look which looks great in any garden and fits seamlessly with the outdoor world. The compromise is that looking after it requires a bit more work than furniture made from other materials. Nothing feels the weather quite like wood, so it is important to keep on top of the cleaning and varnishing to keep it in best possible shape. We recommend monthly cleaning with soap and water to keep the dreaded mould and mildew at bay, and 6 monthly (or yearly at a push) varnishing to keep it looking fresh. The great thing about wooden furniture, which sets it apart from all other furniture material, is that no matter how old or damaged it may be, you can always, sand, varnish, paint and restore it to its former glory. Ready to start shopping for garden furniture?